Life as a successful lawyer's wife and mother to two adorable sons, Kelly really should feel like she has it all. At this stage in life, these things should be comforting and being a stay-at-home mother should be all she needs. Right? Unfortunately, Kelly's just starting the initial stages of a mid-life crisis. A recent scare with her first mammogram test, and a general feeling of being unsettled leaves her feeling as though she's within her life, but feeling as though she is missing...something. And here I was, worried I wasn't ready for a thoughtful summer read! Here, Home, Hope by Kaira Rouda , to be released May 1st by Greenleaf Book Group, is like being with friends, commiserating over marriages, children, and life in general. I adored this book - it fit perfectly in my own life right now. Haven't we all questioned whether or not we're at where we want to be, where we thought we should be, at this stage? It's not as though you don't love what you have, it's whether or not you feel grounded, as if you're really living your life. Let's be honest - problems are all relative. While one person appears to have the perfect life, it's not fair to say that they should just be appreciative of what they have and get over it. More often than not, they do realize that they should be grateful for what they have, and this is what compounds their guilt even more. And this is exactly why I loved all of the characters - they are all real. They are flawed, insecure, confused, and going through one hell of a time right now. Kelly, at the middle of it all, feels that lack of confidence weigh her down even more. Should she start her own business? What could she do after being out of the job market for fifteen years? While she commits to making changes both in her professional and personal life, she begins to put little notes throughout her home as reminders, which are oftentimes both humorous and sad. And although she has friends, they're going through their own issues, too. Along for this personal ride is "borrowed" daughter, Melanie, struggling with tough emotional issues and anorexia, which makes the summer dramatically different than Kelly anticipated. Here, Home, Hope by Kaira Rouda makes me want to sit at the beach on a summer afternoon and look back at my own choices, make changes when necessary, and appreciating what I have as I ultimately become who I want to be. Kaira Rouda has made her jump into contemporary fiction with a story that is inspirational and heartwarming, one that is going to be loved by many. It is a refreshing reflection on finding beauty in everything that makes you exactly who you are. 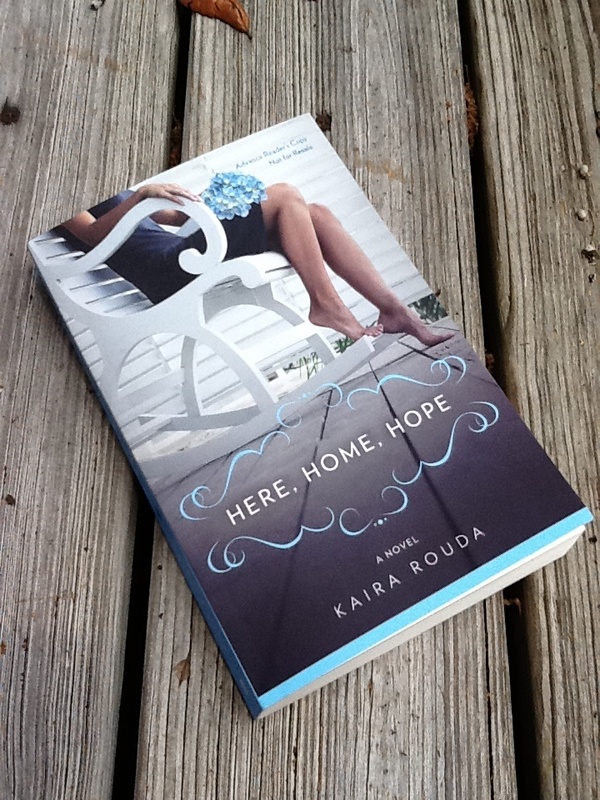 If you like Kristina Riggles' The Life You've Imagined or Sarah Pekkanen's Skipping a Beat, then you'll find a reassuring hug from Kaira Rouda's Here, Home, Hope. Kaira Rouda is an award-winning entrepreneur, marketer, consultant, speaker and author of 20+ years. 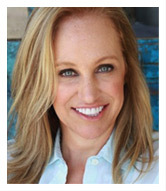 She is the bestselling author of Real You Incorporated: 8 Essentials for Women Entrepreneurs, founder of Real You and brand creator of Real Living, the first national women-focused brand in real estate. Her first novel - Here, Home, Hope - will be released in May 2011. Visit Kaira Rouda by visiting her website by clicking here. Visit Kaira Rouda on Facebook by clicking here. Follow Kaira Rouda on Twitter by clicking here. FTC Disclosure: Thanks to the author for providing me a copy of her book in exchange for my honest review. First of all, I love the changes you've made on your blog - it looks fabulous! Second of all, this book sounds right up my alley! This was a great review, really enjoyed it. I hopped over here from twitter. I'm looking forward to reading Kaira's book too. Ooh I love a good book that you can relate to! And I haven't read either of those two you compared it to but I realllly want to and one is on my TBR! Soo so many books to read! Great review! I've been looking forward to this for awhile. Glad to know it's a great read. what an utterly beautiful title. you are listening to never let me go? what is that like? who is narrating? i can imagine it might be even more haunting than reading it. I have Kaira's book and hope to read it next week. Your review makes me desperate to get on with it. This sounds like a great book; maybe a beach perfect summer choice for me? This sounds amazing and I love the picture. I like when characters have flaws. Oh yes, this one definitely goes on my list for summer reading. Thanks for another great review - every time I come here, I find new books I want to read! This one sounds more multifaceted than I would have thought. I think anyone could relate to what Kelly is going through, no matter what age. Who hasn't felt insecure about a decision or frustrated about their position/purpose in life? Great review! Natalie, the blog looks fantastic! I love the new look! That being said, this book does sound a little more meaty that what you had been expecting, but it actually seems like it would be quite my cup of tea. I am fascinated by women's fiction that has meat and grist, and now I want to add this book to my TBR pile. Thanks for sharing this great review with us! I love the new look of your blog - it is awesome! As for the book, it sounds like my cup of tea. I loved the idea of reading about this woman questioning where she is at in life - its something I can relate to. Thanks to you, I'll be adding another title to my 'books to buy' list. Cheers! Love the new blog look. You're inspiring me to take a whack at mine. This book is on it's way to me, I can't wait now. Thanks for getting me excited for this one. I love a book with real characters that I can relate to the best. This sounds like a must read for me! Not the type of book I usually read, but you've definitely made it sound tempting. This book sounds fantastic! It's going on my to-read list immediately. I'm attempting to write a novel of my own, and my protagonist is asking many of the same questions--namely, why she doesn't feel happy when she appears to have everything she needs. Thanks for the recommendation! I love when an author is really able to make characters seem like people you've come across in real life! Hope you can stop by the blog to say hi! I like books one can relate too, I always say, it's never too late to begin again! And your new look looks great, btw! Oh, this sounds like one I would love. I'll be adding it to my wishlist. sounds like such a wonderful book - how can one go wrong when *real* flawed * characters are involved that make us think about ourselves and our lives and what we might do differently - great review! Thank you all for the kind words - and thank you so much for such a wonderful review! You all are making my heart sing! I hope you enjoy Here, Home, Hope!